Your child is taught by me, Nancy Chartier, exclusively. The sessions are limited to ten students, for an hour and 45 minutes. If you miss a class, you are able to make the class up by coming to another class; they don't expire. I am very protective of the mores of the young actors, and I write the scripts to both challenge them and keep the content age appropriate concerning both language and situations. There are four Acting Sessions for $150; siblings are offered a discounted price of $10, making it $140 per child. I have the child take one class, it's $35, before joining the studio, to see if it's a good fit. ​If you miss a class, it can be made up by coming to two classes in one week so you never 'lose' the class. You can make it up before you miss, or after as long as you are a paying member of the Studio. 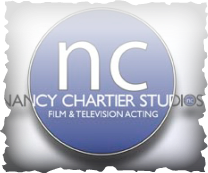 Coached/Taped Auditions with Nancy are $75 per hour, ($45 FOR 30 MINUTES ONLY). Text 469-441-6887 for your request. RINT OUT AND BRING video instructions from Agent and CD, and a copy of the script for Nancy.